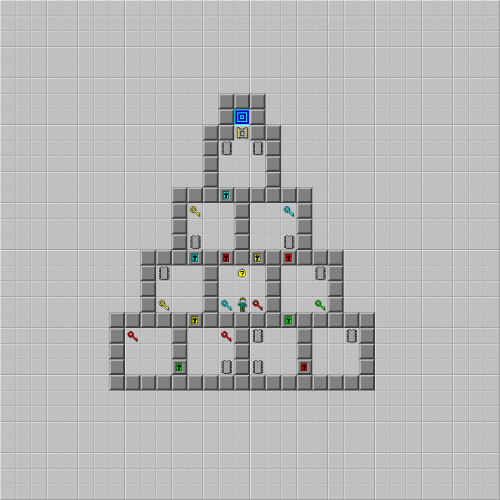 Key Pyramid - The Chip's Challenge Wiki - The Chip's Challenge Database that anyone can edit! Collect all the required chips to open up a socket and exit. Use keys to open doors. Green keys can be used infinitely. 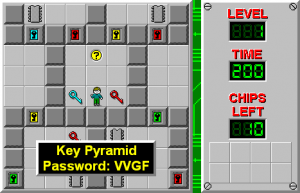 Key Pyramid is the 1st level in Chip's Challenge Level Pack 1, and the first of the lesson levels. This level is primarily centered around emulating what Lesson 1 accomplished in the original Chip's Challenge - teaching the player all about keys and chips and how to use them. Fortunately, much like its CC1 counterpart, it is impossible to cook Key Pyramid, meaning the only way for the player to die would be to let the timer run out. For the fastest solution that beats the level in 32 seconds, there is not much thinking involved - more or less just a simple matter of running back and forth to collect more keys that unlock more chips. However, the one thing that may be worth noting is that when you collect the green key, you must return to get the red key before going down and collecting the two chips below the green key, such that when you return with the red key, you can collect all three chips in the southeast in one go. Awareness slowly returned, as a frantic girl's voice cried, "Chip! Where are you?!" Chip, he thought. Yes, that's my name. But who's that shouting? And where am I? Groping for his glasses and staggering to his feet, he looked around, quickly spotting the loudspeaker in the ceiling that let in the urgent voice. Would it let him answer? Clearing his unnaturally parched throat, he croaked, "Hello?" The voice responded instantly, in tones of sharp relief. "There you are! What happened to you?!" the girl demanded. "No clue," he said, squinting blearily at the sterile tiles and plain gray walls surrounding him. "I was hoping you could tell me. Who are you, anyway?" There was a startled pause; then she replied in hurt tones, "Are you all right, Chip? Don't you know me - Melinda, your friend and fellow Bit Buster?" Melinda...the name stirred a strange rush of warm feeling in him. An almost-recognition, vague as a dream. "I...don't know. I'm all right...but everything's hazy. I can't seem to remember anything! What am I even doing here?" "You volunteered! You're supposed to be testing the Bit Busters' new Clubhouse Challenge, before we turn it loose on the recruits. But we lost contact with you, right after you went inside. And then another emergency came up -"
Her voice broke off, leaving Chip to wonder, Clubhouse Challenge? Recruits? What's going on here? Then she was back, sounding urgent. "Chip, I'm sorry; I'm needed elsewhere. You're going to have to get through the first few levels on your own, with or without your memory. But you're good at this. I know you can do it!" Somehow, even in the haze of his non-memory, Chip felt a strange certainty that he could trust this girl - and that he would rather do anything than betray her confidence in him. Shaking the cloudiness from his mind, he stated, "All right. Tell me what to do!" Warm pride filled her voice as she replied, "Don't worry. We're going to figure out what caused this amnesia, and how to reverse it. But until then, you're going to have to start again at the beginning, and learn all the rules of the Challenge. "Fortunately, the first ten levels were designed to help recruits do just that. In each of these levels, look for a hint. It will provide you with information on how to get past the challenges in that level and reach the exit square. But be careful! Some things in the clubhouse can be a little...unsafe. Just read the hints and you should be fine. "Now I really have to go. But I'll catch up with you in a few levels. Good luck, Chip!" This page was last edited on 13 March 2019, at 23:35.